It was the middle of the week, but it sure felt like Sunday church in Charlotte’s McGlohan Theatre. The spirit was moving in the small, 700-seat venue that once was the sanctuary of the First Baptist Church, in the entertainment complex dubbed Spirit Square. Propelled by Ry Cooder on an arsenal of strings, son Joachim on drums, Mark Fain on bass, Ricky Skaggs on mandolin, fiddle and guitar, wife Sharon on vocals and guitar, daddy Buck on piano, and sister Cheryl on harmony vocals, the group presented a program of songs Skaggs promised were at least 50 years old. Looking like an Old Testament illustration of a mighty Jehovah, Skaggs presided over an evening of down-home musical vittles served up with family-style harmony. Cooder and Skaggs spent the better part of a year picking the set list to feature a glittering array of bluegrass and country royalty. They included songs by the Delmore Brothers, Flat & Scruggs, the Louvin Brothers, Kitty Wells, Bill Monroe, Hank Williams, Merle Travis, and Hank Snow. 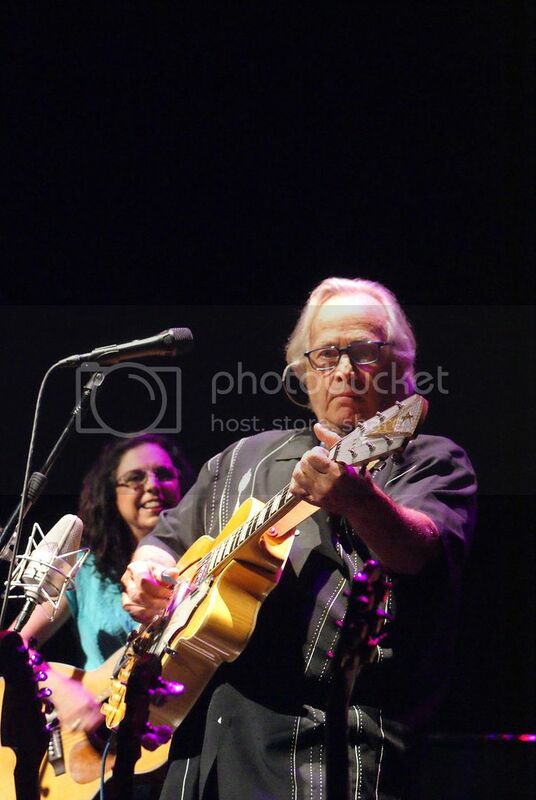 For Travis’ “Sweet Temptation,” Cooder threw out a passel of delicious licks while Skaggs fiddled around him. “He died the year I was born, but Daddy saw him,” Sharon said during her introduction to Hank Williams’ “Mansion on the Hill.” Cooder, Skaggs, and Sharon blended their voices for some family-style harmony and Buck threw in some gospel keynotes from the unholy trinity of Louisiana piano men, blending the styles of cousins Jerry Lee Lewis, Jimmy Swaggert, and Mickey Gilley. “Hank would have been happy with that,” Skaggs said as the last note faded away. Cooder admited he used YouTube for set list research. “Pretty soon that’s all I was doing,” he said, “getting a rep for being antisocial.” But that antisocial research gave him the fuel for a great impersonation of Lester Flatt’s side-of-the-mouth delivery, which was quickly bested by Skaggs’ spot-on version. “Like bringing Lester with us,” Cooder said, before taking the lead vocal on Flatt’s “On My Mind,” slipping in and out of Flatt’s side-mouth style. “Ever think you’d sing bass in a gospel quartet?” Skaggs asked Cooder, introducing the Stanley Brothers’ “Jordan.” Skaggs told Cooder that he grew up in the wrong place for that: California. Cooder did an expert bass-singing job, aided by Cheryl for some Carter Family-style harmony, Skaggs accompanying them with a jangly Jesus riff on mandolin. “Singing bass and playing banjo — they’re gonna love you here tonight,” Skaggs said as Cooder pulled out his banjo for Hank and Audrey Williams ‘ “Where the Soul of Man Never Dies.” I’ve got to say, they love Cooder here no matter what he plays. “Ricky’s played here lots of times,” Sharon told the crowd, but it’s a rare appearance in these parts for Cooder, who’s only other date in the state was years ago with Buena Vista Social club. “Any Jimmy Martin fans in the house?” Skaggs asked, introducing “Hold What You Got.” Buck leaped in first with some Jerry Lee flourishes, but then it was a case of Cooder interruptus as the guitarist slid in on his Cooder-caster all wiggly and greasy. Skaggs lashed back with a rock star mandolin break, but you could still hear Cooder slithering along underneath. Sharon told the audience that “every country set needs a train song,” and the Delmore Brothers’ “Pan American Boogie” filled that gap big time. Cooder greased the rails and Skaggs rattled along at warp speed on mandolin. Cooder said he had to sing the next song, Hank’s Snow’s “Now and Then There’s a Fool Such As I,” because the set list told him to. “But I have some big shoes to fill. It was a big hit for him, never be a big hit for me.” He added that all through his formative years, he realized his potential wasn’t being realized until he heard this song of remembrance and reflection. This night, he kicked off the vocals, and Sharon and Skaggs joined in on the chorus. Buck tossed in a handful of Swaggart keys and Ry laid some shimmery jazzy guitar licks on top. Some early reviews of the tour that began June 16 in Salt Lake City mentioned that Buck jumped in a lot and stayed too long, but on tonight’s presentation he was in and out quickly, getting the right thing said on the piano at the right time. Folks in these parts are rabid Andy Griffith fans — the mythical town of Mayberry was based on Griffith’s home town of Mount Airy, located not far from here. So when Skaggs mentioned that folks at this show may have seen the Dillards, billed as the Darlings, perform “The Old Home Place” on the Andy Griffith Show, a big cheer went up. Skaggs hit it hard, high and lonesome, rockin’ the chop on his mandolin, then Cooder just fingerpicked the snot out of it on guitar. Bob Dylan and Emmylou Harris recorded Ralph Stanley’s “Hallelujah I’m Ready to Go,” but Skaggs’ version rivaled them all, blasting away at warp speed on mandolin, Cooder rattled the banjo like a machine gun and Daddy Buck, whom Skaggs introduced as “the 84-year-old rockin’ cat daddy,” sprinkled in some lively jangle. But there was plenty of real gospel as well. The Louvin Brothers’ “Wait a Little Longer Please Jesus” featured some Swaggarty piano from rockin’ cat daddy Buck. Cooder and Skaggs flashed back and forth so fast they almost overlapped, causing Skaggs to grin wickedly and step back. Cooder ripped out a blistering solo, before Skaggs responded with one of his own. The interplay between the two was fun to watch. The respect Skaggs has for Cooder was obvious, but he didn’t give much ground, throwing down the gauntlet time after time and grinning from ear to ear at the response he got. Cooder, too, was respectful of the talent surrounding him onstage, never overstepping or staying too long in the spotlight. There’ll be no more tobacco in the land where all is pure. It was a big foot stomp with Cooder pounding away with religious fervor. 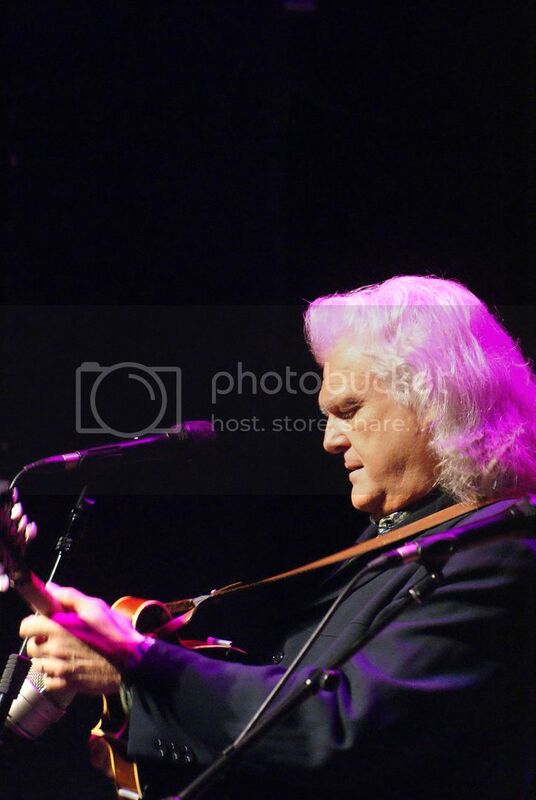 The crowd got sent home with Skaggs and Cooder battling it out on Flatt and Scrugg’s “Don’t Get Above Your Raisin’,” Joachim watching the skirmish from behind his kit, grinning from ear to ear. Even though the show was over, there was still stuff to do — Cooder had a passel of stuff for sale: two books, a short story collection, L.A. Stories and I Flathead, with a fictional band, Kash Buk and the Clowns, featured in print and on record. There was also a CD, 2011’s Corridos Famosos, recorded live over two nights at the American Music Hall in San Francisco with Joachim, Flaco Jimenez, and Terry Evans. There was a poster commemorating the tour as well. Skaggs also has a book, Kentucky Traveler: My Life In Music, as well as CDs to sign and flesh to press. I finally stumbled out of the theater, weighed down with memories and memorabilia, but before I could even got to the door, I’m already wanting more. Its just too good not to come around more often. If anybody up there is listening, in Nashville or Heaven or even Hollywood, please answer our prayers. You don’t have to save us. Just hook us up — at least one more time.